One Sunday evening last month, when my husband and I returned home from a weekend trip, we found grass and debris on our front porch, right on the welcome mat. Strange, we thought, because the pet sitter had been there a few hours before to look in on our cats. By the end of the next day, it was clear what was going on: two robins were building a nest in a corner of the transom window above our front door. It’s a great, if a bit precarious, location, protected from rain and wind but perched in a pretty narrow space. And every time someone goes in or out the front door, the robins go on high alert to guard their nest, and the human offender, whether resident, visitor, or delivery person, is forced into a hasty retreat. When I was a very young child, I believed that birds lived in their nests all the time. For this misperception I blame at least one childhood song, story, or poem that spoke of birds returning to their nests at day’s end. To me, a bird’s nest was its home. 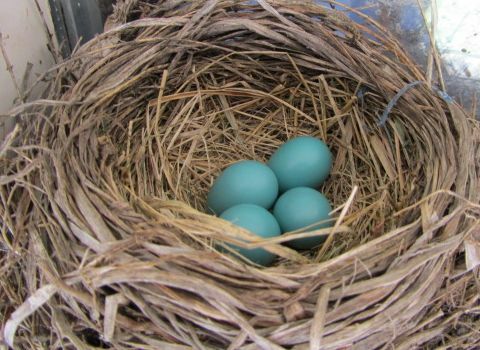 But as I grew up and learned more about birds, I found that a nest is really a nursery, a birthing room. Some birds, such as eagles, return to their nests year after year to bring the next generation into the world; others construct a new nest each year late in the winter or early in the spring. Compared to many of my friends in Iowa, my family has relocated a lot. Whenever we move into a new house, I resist the urge to make it my own because, so far, I haven’t lived anywhere that I would consider my permanent home. Every house is just a way station for us. My husband dreams of retiring back in the southeast, and maybe that will happen. But for the past nine years, we have felt at home in Iowa. My daughter teases me a little bit about not getting the pictures onto the walls or painting any of the rooms (except hers) to get rid of the standard Realtor Off-White, but my thoughts are always on resale. The kitchen will need to be redone, and the walls will all have to be neutralized anyway, so why put a lot of time and money into the décor when it’s all temporary? Our houses have been more like nests for us, places that have sheltered us while we’ve lived and worked and raised our daughter. Then we’ve moved on. Environmentalists like to say, “Tread softly on the earth.” We shouldn’t be bad tenants, marking up the walls, damaging the appliances, and destroying the furniture. We should be good caretakers of the planet, not abusers. As followers of Jesus, we might modify that saying to “Live lightly in the world.” By that I mean that we should remember that the world is more like a nest for us than a home. Scripture tells us that although we live IN the world, we should not be OF the world. This is not our final destination, so we should not get too attached to worldly things. We can think of the world as our nursery, a place for us to be born and grow and practice living by the example of Jesus. We can build relationships and love others, show kindness and compassion, and share what we have with other people. Then, one day, we will fly away from this nest to our real home with Jesus, where we can live out everything we’ve learned. There’s a lot of talk in the Christian world about legacy. How should we live our lives? What will we leave behind? How do we want to be remembered? While I agree that we should be thinking about what we do that will outlive us, I’m not sure I agree with the whole legacy thing. My purpose on earth is to reflect the glory of God, not to try to bring glory to myself. Should I even be thinking about whether anything I do will keep the memory of me alive? We frequently don’t know the impact our words and actions have on other people, especially long term. If we focus too much on how the things we do will build up our legacy, maybe then we focus too little on whether those things glorify God. If we give up the idea of how, or even whether, the world will remember us and instead consider how God thinks of us, maybe living a life that reflects God’s glory can become simpler. Liberating, even. There’s no projecting into the future, only loving and serving in the present. “For I know the plans I have for you,” declares the Lord, “plans to prosper you and not to harm you, plans to give you hope and a future” (Jeremiah 29:10-12). Recently I watched a show on public television about time. As the physicists explained what science can tell us about the past, present, and future, I began to wonder if Henry David Thoreau didn’t have it right when he wrote, “Time is but the stream I go a-fishing in” around 150 years ago. He went on: “I drink at it; but while I drink I see the sandy bottom and detect how shallow it is. Its thin current slides away, but eternity remains” (Walden; or, Life in the Woods). I like the image of mercurial time flowing across immutable eternity. To me it’s strange to think that while we humans are subject to time, God is not. For God, there is no past or future (those physicists might argue that the future does not even exist or is, at best, only theoretical). In eternity, everything is in the present because time doesn’t exist. Once I read somewhere that it’s as if everything that has ever happened or will ever happen is in a book, and although we experience the book one page at a time, in order, from beginning to end, God can open the book and turn to whatever page he likes because it is all under his authority. We can remember the events of the past, but we cannot relive them; we can speculate about the future, but we cannot go there. We must experience life one day—one moment—at a time. Living in the present is difficult. There are things we might regret saying or doing, but they are in the past and we can’t change them. There are things that haven’t happened yet that we might be anxious about, but they are in the future and we can’t control them. 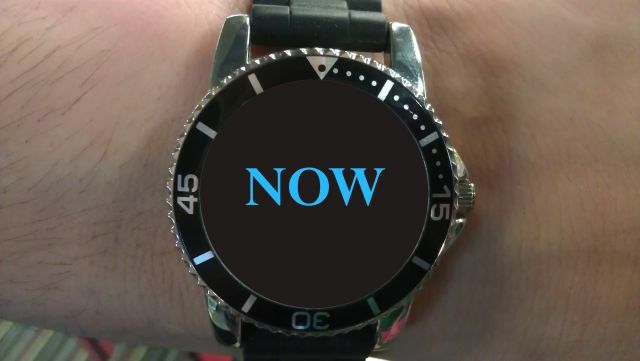 Why is it so hard to anchor ourselves to the here and now? I think such a thing requires discipline. Whenever I realize I am drifting away, either backward or forward, I need to focus on the moment I’m living, right now. This requires that I become mindful of where my thoughts are taking me and that I have the desire to experience life anew, not just relive what I’ve already done or imagine what I might do. Such a thing also requires courage. We don’t know what will happen as a result of our actions or decisions, so we do the best we can with what we do know, and we leave the rest up to God. So such a thing also requires faith. We have to be confident that whatever comes next, whether we are directly or indirectly responsible for it, we will be able to accept it and move on. We also need to be able to believe that if something bad happens, in some way we can benefit from the experience, even if only by surviving it. We are more than the choices we make, but those choices are significant. We might look back and wonder how we could have been so wrong about decisions we’ve made. But we need to remember that we are constantly being shaped by the moments we live, so that person who made a certain choice in the past might make a very different choice now. When we try to look forward, to imagine all the possible outcomes of a decision, there are many scenarios; when we look backward, there is only one. We have to be gentle with ourselves and forgive ourselves for what have turned out to be bad decisions made with good intentions. Regret is a powerful force that tries to keep us in the past. That doesn’t mean we have to forget the past or ignore the future. The past is not our enemy but our teacher. We all need to recall yesterday so we can enjoy the pleasant memories and learn from our mistakes, and we need to plan for tomorrow with the expectation that we will continue our journey. But the time to actually live our lives is today, this moment, because now is the only time we have.